Tanya Davis's poem How to be Alone, illustrated by Andrea Dorfman, could make a fine gift for those long-term single people, newly-single people, or people who, while part of a couple (or trio? ), nonetheless like to be alone but society has convinced them that being alone is a bad thing. I wasn't sure if I'd appreciate it at first, despite someone who does, in fact, like solitude. It began with the feel-good advice and literalness that I didn't really enjoy in Rupi Kaur's Milk and Honey. 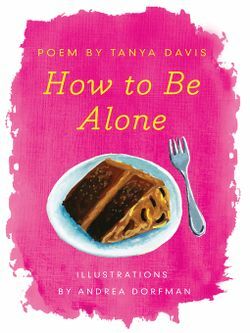 However, as a single poem it began to develop into itself and some of the scenes portrayed reminded me of the lightly provocative moods of better haikus. The art by Andrea Dorfman has a folkish quality that suits the tone.